on a white sand beach. A unique moment where you will taste fish and seafood caught off Phu Quoc. To make this exceptional lunch perfect, you will be initiated into snorkeling. A unique occasion to admire the multicolor fish that inhabit the coral reefs.. 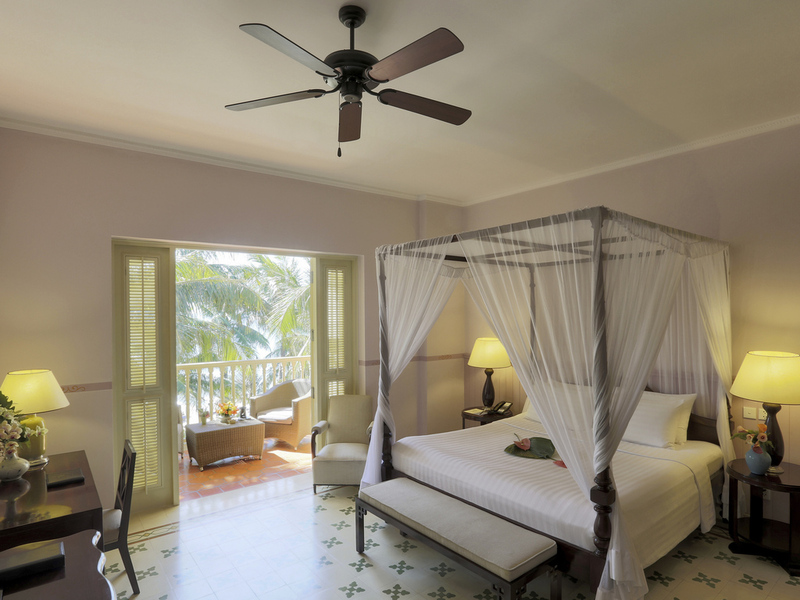 The protected paradise of the island of Phu Quoc, an unspoiled natural landscape comprising hills, forests and white sandy beaches and a turquoise sea just perfect for diving. 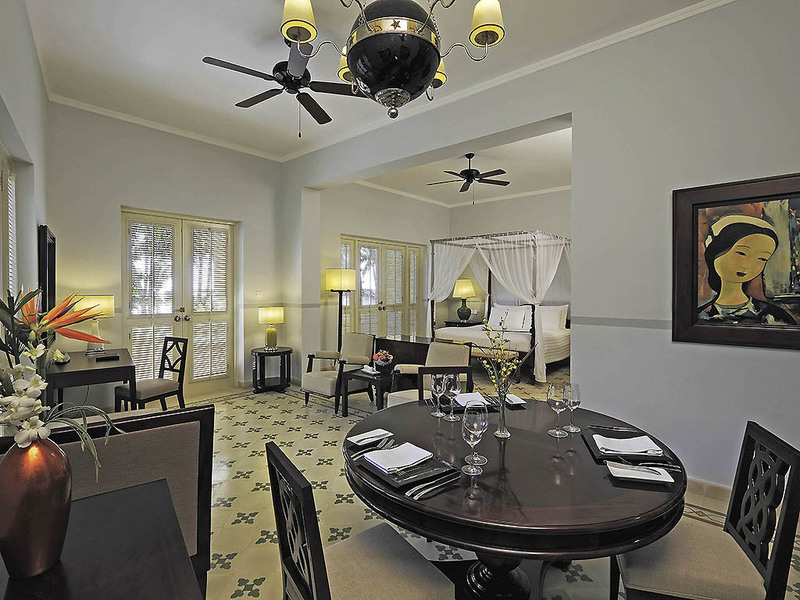 In luxurious tropical gardens, a building in the 19th century colonial style .. Moments of rare delight that you must seize when they arrive to transform them into unforgettable memories. This "very Epicurean philosophy" is adopted by the hotels of the MGallery collection. There are 12 flights every day from Ho Chi Minh City to Phu Quoc Island and a complimentary shuttle bus service is available from the airport. There are daily ferries from the mainland, Rach Gia, and complimentary shuttle bus service is also available. Set in a colonial mansion surrounded by lush botanical gardens, this cosy 38 m² (409 sq.ft.) room features a terrace with its own private patio or balcony, satellite TV, upscale organic amenities, a ceiling fan, complimentary WIFI, JBL docking station. 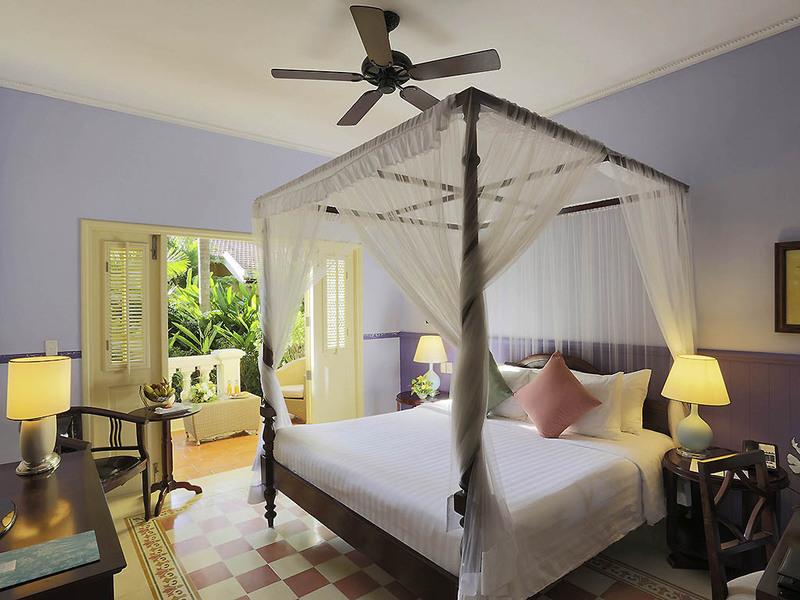 Set in a seaside mansion amidst lush botanical gardens, this comfortable 46 m² (495 sq.ft) room features a private terrace or balcony with garden views, satellite TV, upscale organic amenities, a ceiling fan, complimentary WIFI, Bluetooth docking station. Set in a seaside colonial mansion amidst lush botanical gardens, this spacious 55 m² room features a separate study area, private terrace or balcony, satellite TV, upscale organic amenities, ceiling fan, complimentary WIFI, Bluetooth docking station. For those who love the restful atmosphere of the sea and palm trees, this comfortable 46 m² (495 sq.ft.) 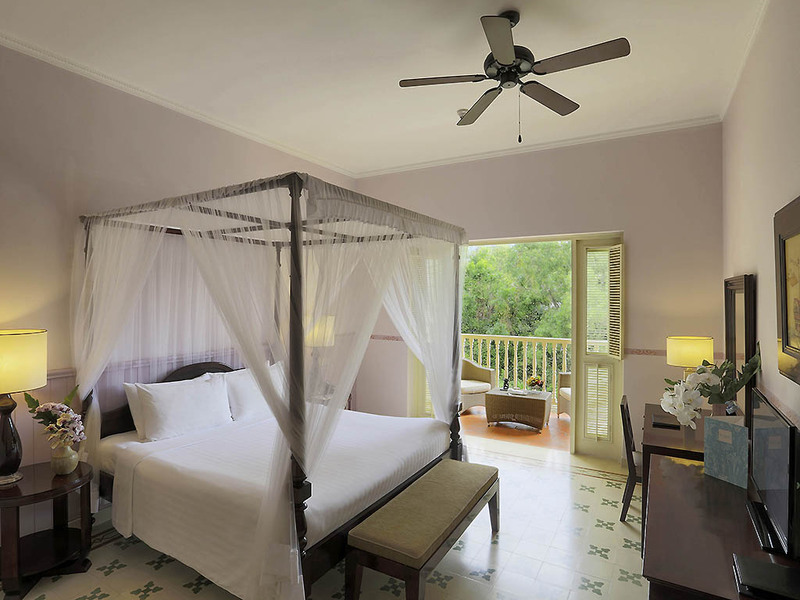 room features a private terrace or balcony with sea view, satellite TV, organic amenities, ceiling fan, complimentary WIFI, Bluetooth docking station. Enjoy the restful view of the sea from your lion claw bathtub. This memorable 53 m² room features a sea view bathroom, private terrace or balcony, satellite TV, upscale organic amenities, ceiling fan, complimentary WIFI, Bluetooth docking station. Experience traditional bespoke sophistication. This huge 73 m² suite with stunning sea and sunset views, features a dining and living area, private terrace, bathtub and shower, satellite TV, ceiling fan, complimentary WIFI, Bluetooth docking station. For travelers used to ultimate luxury, our large 71 m² Signature beachfront villa, set in its own private garden, features a living area, private terrace, bathtub and shower, satellite TV, ceiling fan, complimentary WIFI, Bluetooth docking station. 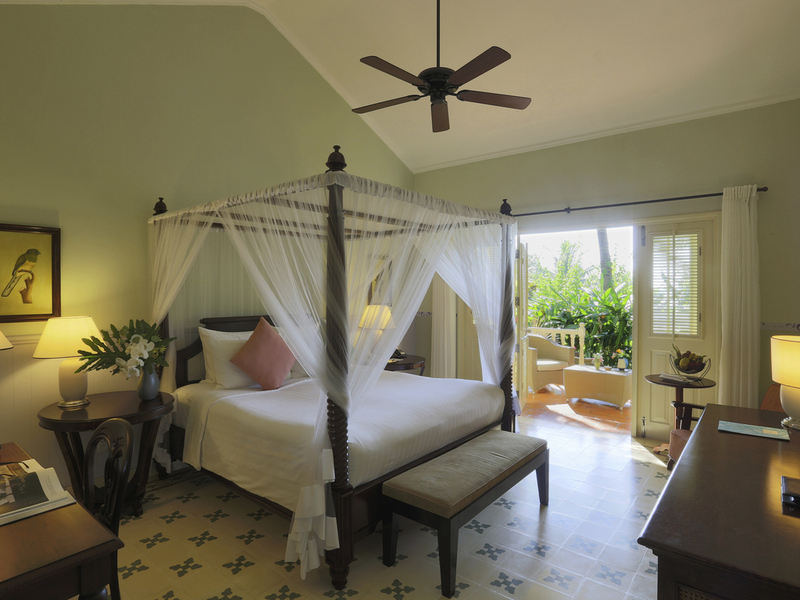 This lodging boasts a truly indulgent and private atmosphere. The large 63 m² villa is set in its own private botanical garden, bathtub and shower, satellite TV, upscale organic amenities, ceiling fan, complimentary WIFI, Bluetooth docking station. The Pepper Tree commands stunning views over the ocean and the view at sunset is incomparable. Combine this with the innovative Pacific Rim cuisine devised by our talented team of award winning chefs and you have the perfect sensory experience. Breezy and inviting, with soft lighting and sophisticated art deco design, Le Bar comes into its own after sundown. Our bartenders offer a range of delicious wines, cocktails and spirits and a unique atmosphere of quiet indulgence. The Pepper Tree commands stunning views over the ocean and the view at sunset is incomparable. Combine this with the innovative Pacific Rim cuisine devised by our talented team of chefs and you have the perfect sensory experience. The Lounge Bar is open everyday serving a menu of light refreshments, ice cream and cocktails. Being able to look over the ocean, watching the sun set, makes this the ideal place for a relaxing afternoon before the night falls. Travelers in search of relaxation will find endless ways to recharge in the collection's hotels. The spa & pool offer the chance of a well-deserved break.